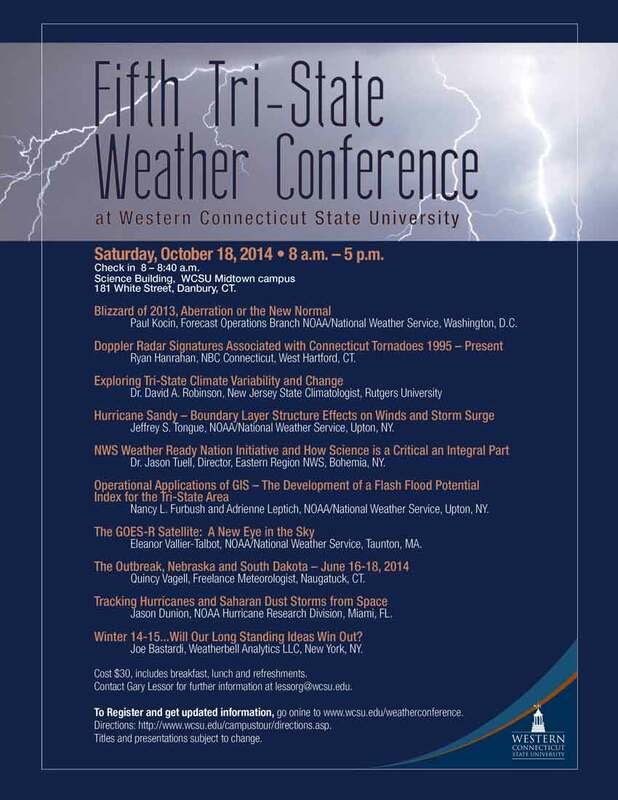 Saturday, October 18, 2014 will be a memorable day for those who attend the Fifth Tri-State Weather Conference in Danbury, CT at Western Connecticut State University (WSCU). Joe Bastardi (Weatherbell Analytics LLC) plus many others. The AMS Chapter and WCSU have minimized the cost of registration to $30 which includes breakfast, lunch and refreshment breaks. Please join us at another diverse, yet informative conference with speakers and topics from near and far. By all means, forward the flyer and/or e-mail to your friends and colleagues. Middle, high, and college students interested in meteorology are encouraged to attend. Enjoy the rest of the summer and see you all on Saturday, October 18, 2014.